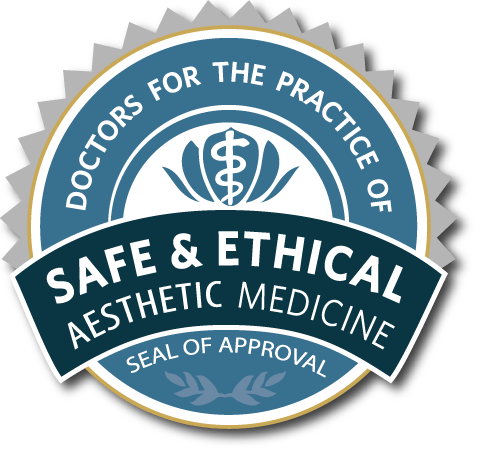 One of the reasons that we have so many satisfied patients at Clarus Dermatology is because of our quality aesthetic outcomes from surgical procedures. 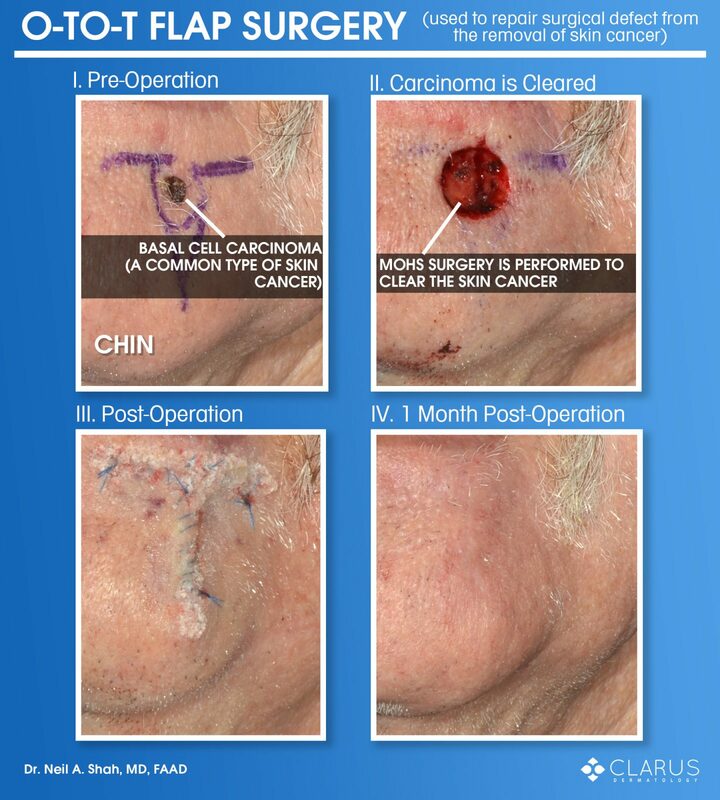 The images here are from a patient that had a basal cell carcinoma, a common type of skin cancer, on his chin. 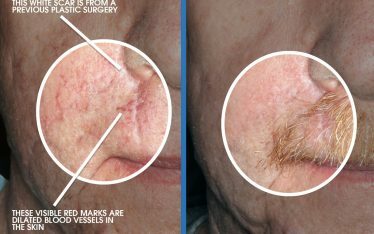 Even though the scar is nearly undetectable a month post-operation, there is a lot of unseen effort to achieve that outcome. 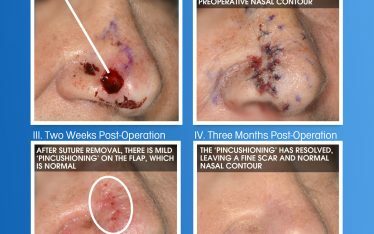 After the skin cancer was diagnosed on the patient’s chin, board-certified dermatologist Dr. Neil Shah performed Mohs surgery to clear the carcinoma from the skin. You can see the round surgical defect created by removing the skin cancer in image II. and it visually forms the O in the O-to-T flap surgery name. The next part of the O-to-T flap, as the name suggests, is turning that O into a T – which can be seen in image III. if you look at how the blue sutures form a T. During the surgery, Dr. Shah removed redundant tissue below the defect and removed two crescent-shaped wedges along the marker guidelines (seen in image I.) to create flaps of skin that were rotated into place and sutured back together. 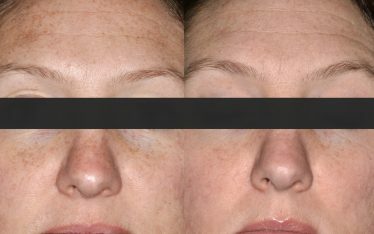 This crescentic modification of a bilateral rotation flap – the formal name of an O-T flap – creates a cleaner scar line. The O-to-T is a workhorse flap for defects on the chin and is used here because a standard linear closure would have run out of skin real estate, going into the lip – which would not have been desirable for the patient. There is a lot of cognitive effort that is required by the surgeon throughout this process that goes unseen. Knowing which surgical procedure to use and how to best perform it requires significant education, training, and experience. 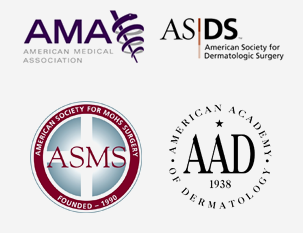 That is why we always insist on patients seeing a board-certified dermatologist for their skin care needs.